Expo 2020 Dubai revealed its master plan displayed at the two-day Arab Media Forum which opened at the Dubai World Trade Centre on Tuesday. Visitors to the 15th edition of the forum were among the first to take a glimpse at how the Expo 2020 Dubai site will look and feel upon completion, through augmented reality and leading-edge digital technology. The mega event’s site was unveiled through the use of augmented reality and leading-edge digital technology. The Expo pavilions will be dedicated to sub-themes Opportunity, Mobility and Sustainability under the main theme ‘Connecting Minds, Creating the Future’. Expo 2020 Dubai will take place between October 20, 2020, and April 10, 2021, with approximately 25 million visitors expected. Reem bint Ibrahim Al Hashemi, Minister of State for International Cooperation, Director-General of Expo 2020 Dubai, said the Expo 2020 Dubai’s master plan truly reflects the theme of ‘Connecting Minds, Creating the Future’, and aims to seamlessly integrate the three subthemes into the urban design, infrastructure, delivery, operations, and legacy of the mega-event. She added that the master plan aims to enable all involved with the event to benefit from an inclusive experience with specific attractions, services, amenities, and design considerations that maximise enjoyment and comfort for all. The Expo site will spread across a two-sq km, revolving around the Al Wasl meeting plaza – the figurative and literal heart of Expo 2020 Dubai. Spreading outwards from Al Wasl will be three Theme Districts, each boasting its respective Theme Pavilion. 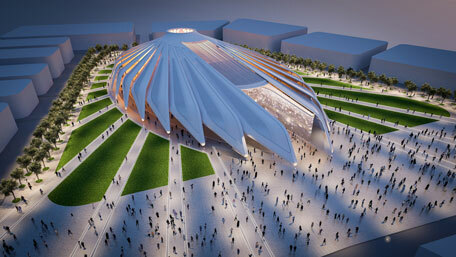 He said that the work is underway in full swing as per the schedule on the event site, and added that the unveiling of the master plan is to inform guests of the forum on the would-be design of the Expo 2020 Dubai.